One piece, topstitch, lay-flat collar. Two-way concealed Nomex taped brass break-away zipper, concealed snap at top of zipper at neck. 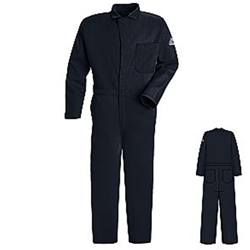 Fabric: Flame resistant, 9 oz. 100% Cotton. Protection: Arc Rating ATPV 11.2 calories/cm². Short: 5'3"-5'7" Regular: 5'7"-5'11" Long: 5'11"-6'3" XLong: 6'3"-6'5"